Halloween can be both fun and scary for your pets, too! In fact, Halloween can be one of the more dangerous holidays for your furry friends, so it’s important to keep pet Halloween safety in mind, first and foremost. It’s easy to enjoy this spooky season by keeping a few simple Halloween pet safety tips in mind. Pet costume safety isn’t something to think about throughout the year, unless you frequently dress your pets up for other occasions. During the Halloween season, however, everyone is much more tempted to purchase adorable pet costumes. Let’s face it: Halloween pets are the cutest! However, this poses certain risks. First, not every animal is happy when wearing a costume, and animals that are upset or agitated are more likely to act out by running away, growling at people, or even hurting themselves and others. If your pet loves to dress up, make sure the costume is a good choice. Whatever costume you choose, it should facilitate a full range of movement and shouldn’t limit your pet’s sight, hearing, or breathing abilities. Also make sure there are no items that can be chewed off, pose a choking hazard, and no cords that could accidentally wrap around the neck, which can result in strangulation. Pet costume safety is vital. Chocolate can be very toxic to cats and dogs, so it’s important to keep the Halloween candy out of reach of your pets. Also be cautious with fruity sweets, even though they may seem more “natural” and safe. Many of these sweets contain other ingredients that can make your pets sick, including xylitol, a common sugar substitute. If your pet does manage to get into the candy, play it safe and immediately contact your veterinarian, or—if after hours—your local veterinary hospital. Halloween is incredibly fun to decorate for with so many options, but some classic Halloween decorations can harm your pets. Open flames inside jack-o-lanterns, for example, can cause burns if your pet is sniffing around, or even a fire if your pet knocks it over. Fake spider webs, ribbons, strings, and other Halloween decorations can be choking hazards for pets, as well. Those furry companions do like to play with, bite, and eat random things around the house, as you well know. Keep all of these things out of your pet’s reach for optimal pet safety. If you’re into special effects, items like dry ice and electrical wires also pose hazards to pets. As part of your Halloween pet safety, keep these items away from your pet and, if needed, keep pets completely out of the rooms where these decorations are located. Some aspects of Halloween are natural triggers for pets. Strangers come to the door, the doorbell rings often, people are unrecognizable, and so on. 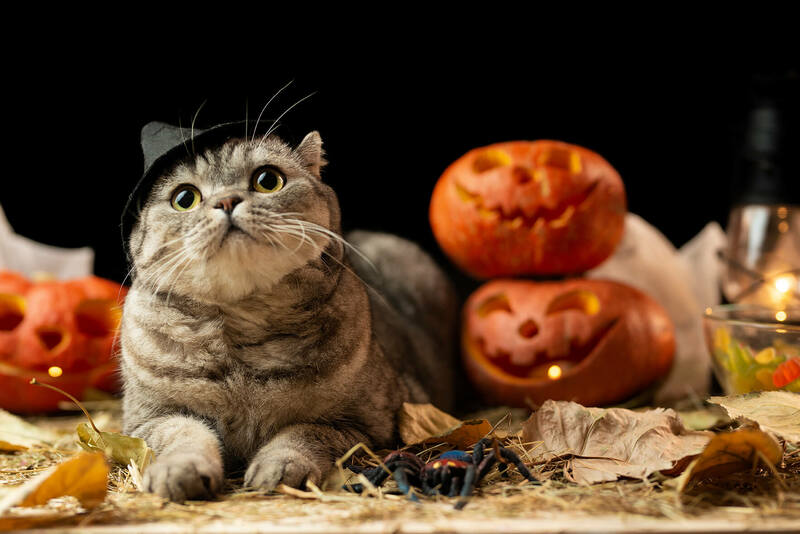 To help your pets get ready for Halloween day, try to ease their anxiety by using the doorbell, playing in costumes, and showing them masks—if you can—much like a game. Begin this as far in advance of Halloween as you can to get the best possible results. On Halloween,a vital step for keeping pets safe is to get them in the best mood possible. This means getting their energy out and giving them lots of love and affection. Take dogs on a nice, long walk in the early afternoon and head to the dog park for some running around, off-leash. For cats, get out those cat toys and play, play, play. This exercise releases feel-good chemicals, decreases anxiety, and makes pets more likely to sleep through the chaos when trick-or-treaters come around. With any luck, your pet will be by your side during the Halloween festivities, but many times this holiday is just too much for our fur babies to handle. Have a safe space set up in your home for your pet to rest during the celebration. Include a cozy pet bed and some of their favorite toys, in a quieter and more tucked away room of the house. 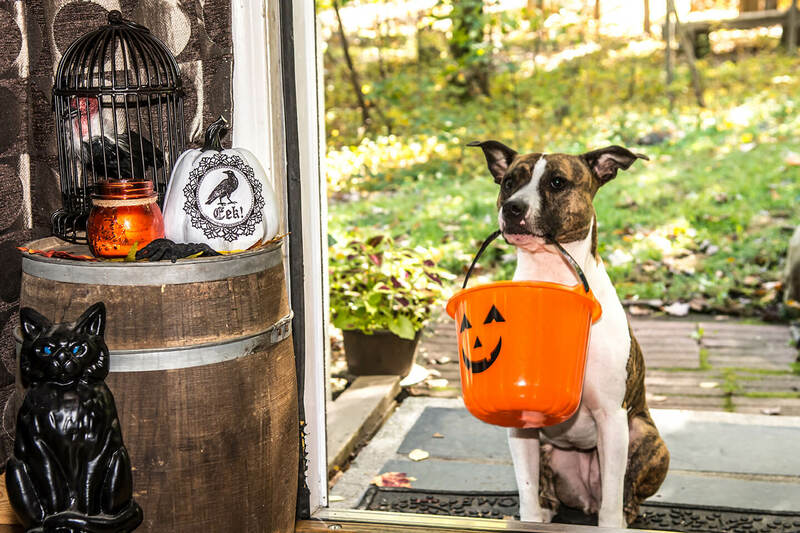 If you plan on taking your pet door-to-door with you, be ready to return home to drop them off, just in case your pet becomes anxious and overwhelmed by the Halloween festivities. If you’re staying home and handing out candy, the door to your home will be opening often. Every time it does, this is a potential escape for your pets. Keep in mind that even if your pets wouldn’t usually rush out the door given the opportunity, things can be very different on Halloween. Your pet could get scared, anxious, or feel just too tempted to sit still. If you’re going out, there’s always the chance your pet could run off, too. If your pet doesn’t already have a tag and/or microchip, now is definitely the time to get one. Because collars can come off, we suggest both—to ensure the safe return of your furry friend when someone finds him. Feeling more prepared with these tips in mind? That means it’s time to move on with the preparations for Halloween festivities. We’re here at Wags & Whiskers in Sahuarita, Arizona for your pet’s grooming service, whether in preparation for Halloween, a full fall grooming service, or just a bath & brush.